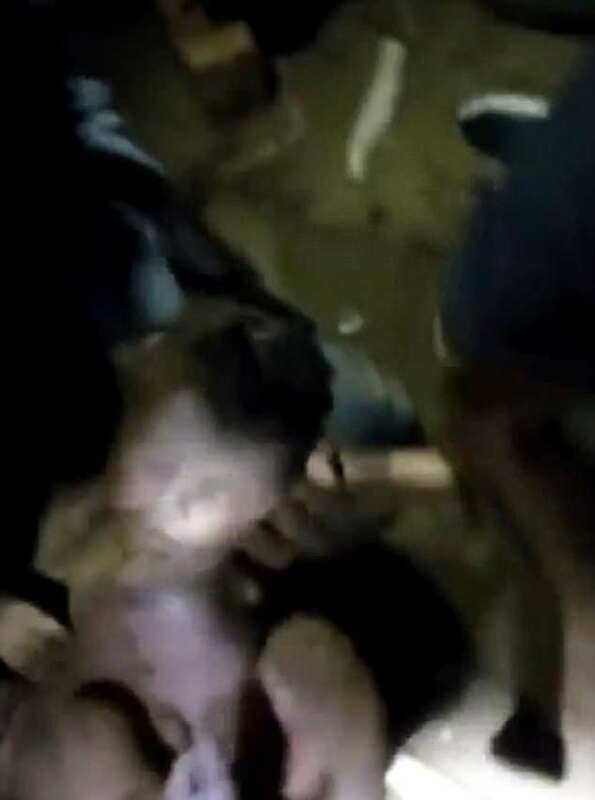 This is the moment a newborn baby, buried alive for eight hours, is miraculously dug out from a shallow grave by police in Brazil. 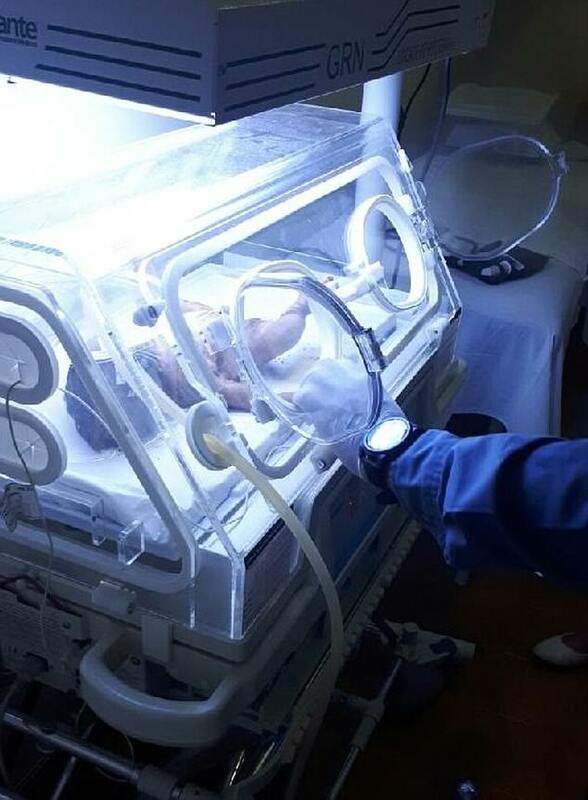 Relatives laid the baby girl to rest believing she had died at birth. 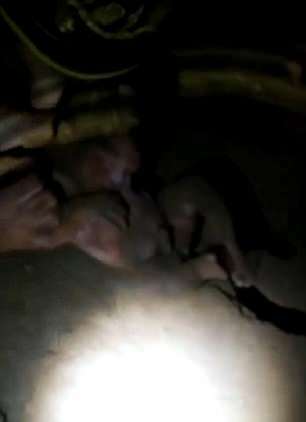 But a harrowing video shows two officers kneeling over a hole in the ground in the dark with only a torch light to see as they shovel dirt away from the top of the baby’s head. Police expected to find a dead body but were shocked to hear a tiny whimper as they scraped away the earth. Using their bare hands to shift the dry soil, agents pulled the child out of a 50cm deep hole around 10pm on Tuesday. She emerged caked in mud still attached to her umbilical cord and struggling to breath after being underground for a lengthy period. The tot was rushed to hospital with paramedics clearing her airways and administering oxygen in the ambulance. Doctors transferred her to intensive care following tests and scans and said the resilient child is making good progress despite her traumatic start to life. Officers were alerted to the incident after receiving an anonymous tip off that the death of the newborn had not been reported to the relevant authorities. They went to the family’s home in Canarana, central west Brazil, to investigate the allegation and to search the grounds. The tot was apparently born around midday to a 15-year-old Brazilian indigenous Indian girl. The young mother said she was alone in the bathroom when her contractions started. She claimed her daughter arrived quickly and fell onto the bathroom floor hitting her head. The infant suffered two cranial fractures which are being monitored by paediatricians at Agua Boa Regional Hospital. When the baby apparently failed to cry after being born, the 57-year-old great grandmother, named as Kutz Amin, allegedly told police she believed the baby was dead. She claimed she followed tribal customs and wrapped the girl in a cloth and buried her in the backyard. She allegedly said her great-granddaughter ‘showed no signs of life’ before she entombed and completely covered her with earth. According to police the family admitted failing to report the baby’s death but ‘believed they were following traditional customs’ so did not hesitate to point out where the unmarked grave was. Canarana’s military police chief, João Paulo Bezerra do Nascimento said to G1: ‘The child was buried around 2pm but we were only called to investigate the incident late that night. This was worrying because it was many hours after the event. The chief admitted to being alarmed by the family’s handling of the situation and amazed at the tot’s survival. He said: ‘What shocked me most was how the little girl survived under the earth for as long as eight hours. It’s nothing short of a miracle. The clip shows the officers gently trying to dislodge the baby in an effort to ease her out. As one scoops handfuls of dirt out of the hollow area and the other uses a hoe to scrape the loose earth away, the baby lets out a faint cry. Shouting excitedly: ‘She’s alive, call the ambulance’, the officers frantically increase the urgency of their mission..
‘It looks like all the bones in her body are broken,’ one concerned onlooker commented when the baby’s arm emerges. Then, slowing down the pace to limit any possible damage to the little mite, Chief Nascimento slides his fingers under the baby’s arms which are by her head and begins to pull her out. To everyone’s amazement, the tot is extracted from her tomb without any major injuries. The teen mother was questioned by police and has been hospitalised with complications following her unsupervised delivery. Investigators revealed they arrested the great-grandmother on charges of attempted murder. She is expected to appear in court on Thursday.